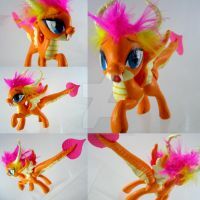 Mane and tail sculpted by me using Crayola Model Magic. Painted with DecoArt Americana Acrylic Paint. Polished by Sally Hansen and Mod Podge. I believe her unofficial name is Cinder Glow. don't quote me on this though. Ether way, it's good looking.